We all know plants need water to grow strong, but too much of anything isn’t a good thing. Let’s discuss some dos and don’ts when it comes to watering your lawn or garden, as well as ways you can determine your vegetation’s watering needs. Water thoroughly. Most plants concentrate their roots anywhere between 6”-12” below the surface, and getting adequate amounts of water down to their roots can take time. Consider mulching your garden. Mulch will reduce the runoff your soil experiences, and slows the evaporation of water sitting on the surface, not to mention the cooling effect it provides during hot days. Limit your watering to once a week. One thorough watering is better than a daily routine so your plants don’t become stressed with too much water to absorb. This also helps to avoid fungal and pest problems. 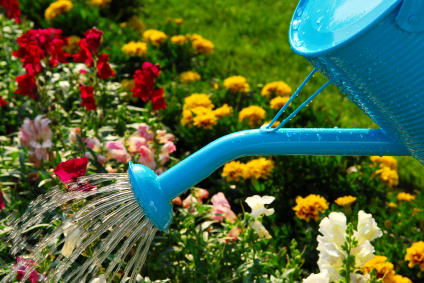 Water your plants during the hottest part of the day. Aim for early morning or early evening watering cycles so there isn’t as much heat to potentially evaporate your watering efforts. Water the leaves. Plants are smart and know how to distribute their water appropriately. Watering leaves can encourage mildew or other growths that flourish in moist areas. What type of soil do you have? A clay-based soil will draw water away from a plant’s roots and will take much longer to drain completely. If your soil is mostly sand-based, you run the risk of losing nutrients too quickly for the plants to absorb them. In either case, try adding EM Bokashi compost to your soil to improve its moisture retention by increasing microbes and organic matter. Have you ever tried to predict the weather based on your garden’s surrounding environment? For example, it’s a safe bet that you’re looking at clear skies and more sun in the coming days if there is an abundance of bats flying around at night. On the other end of the spectrum, you could be looking at some rain showers if you see trees that are turning up or retracting their leaves. If your leaves are developing brown edges, you might have water stress on your hands. Consider scaling back the amount of water you give to said plants. If you want to keep track of your yard’s or garden’s water levels, consider buying a rain gauge. You could also buy moisture meters at your local garden center. These little gadgets go into soil and measure the amount of moisture. They can tell you when to water and when not to water.